Unibroue's Quatre-Centième Beer - In honour of Québec City's 400th birthday in 2008, originally uploaded by Cody La Bière. Call ma beer hoarder, because that's exactly what I am. I prolong drinking beer for a long time, it stays in my fridge and doesn't get drunken. Why? 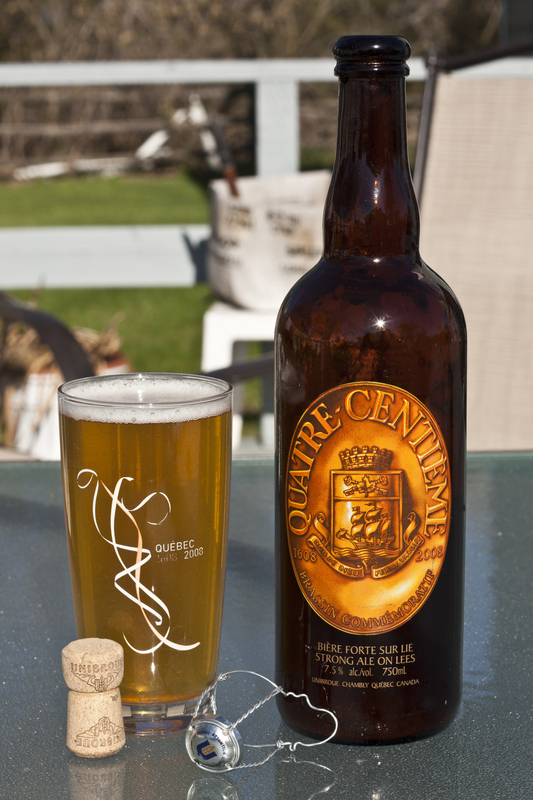 For beer that's hard to find, such as the Quatre-Centième, I can only drink it at a special time. Like the Burly Wine in my last piece - I was saving it for my birthday, but due to winter-like weather, I prolonged drinking it even longer. The Quatre-Centième beer reminds me of good times, living in Quebec City in 2008, meeting amazing people, and 2008 was hands down, the best year of my life. Every time I look at this beer in the fridge, I get depressed and miss Quebec. It's been 3 years since I last had a job, and there's no good news in sight. Anyyywho, Like the Raftman I had waiting in the fridge last year, I expected the beer to explode as soon as I popped off the cork, nope - the beer cooperated. Appearance: Has a hazy golden colour, with lots of sediment - lots. It is the most "lager" looking beer out of ALL of Unibroue's beers - aside from The "U" Line. Even with being in the fridge as long as it did, it still has a formidable amount of carbonation. The head is white. Another thing, the bottle is painted label - a rarity in the world of beer in this day and age. I really appreciate a painted label - EVEN if the beer is crap. This beer is a Unibroue beer so it's not crap, of course. You can see the back of the label here. Aroma: Very light smell to it, a bit of a yeast smell, as well as the smell of ANY Unibroue beer, but it's very minimal, but the aroma lets you know that, yes, it is in fact, a Unibroue beer. Someone with better smelling sense will notice it more than myself. Taste: Coppery ale taste, it has that Unibroue « zing » we've all come to know and love, a taste similar to La Fin du Monde, but much much lighter. Has a bit of a citrus taste to it, as well - for a brief second I could taste bubble gum. It has an ABV of 7.5% and is 750mL, I paid around $5.40 in Quebec for the bottle. Overall? I enjoy it, it brings me back memories. I have one more bottle remaining, and will probably drink that around fête nationale du Québec (le 24 juin) or so. Let's hope I find employment, soon! It'd be even awesomer if it's something in Quebec City. Santé!